The Pacific dulie 26 inch tandem is the perfect tandem bike to go riding around the neighborhood, bike trail or anywhere you want to do. 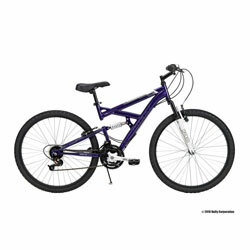 Equipped with a steel mountain style frame for durability and alloy wheels are lightweight and strong. The Shimano rear derailleur and 21 speed index twist Shifters make this bike a breeze to ship easily. Powered by Online College Graduate - Created by Lucky Themes.